More than 50 new full-time student in the MBA program at the University of Iowa came together for a Build-A-Bike Team Building Event at the Levitt Center on the university campus. the participants had been in orientation meeting and used Build-A-Bike as a time to get to know each other better, learn some team building skills, give back to the community, and have a lot of fun. The end result was lessons were learned, activities were enjoyed, and 8 new bicycles and helmets were given to children from the Neighborhood Centers of Johnson County. The event is fast-paced with many activities that keep the participants engaged and entertained. It was a lively group, with fantastic problem solving skills and varied talents and abilities that helped each team complete the tasks assigned and build the bicycles. The new MBA students worked well together and showed great team building and leadership acumen by being very quick in overcoming the obstacles, tasks and problems set before them. It is too often the case that when surprises happen and we are caught off guard that we flounder trying to realize what has happened, what was the cause and what do we do about it. The solution can often get lost in looking for fault, blaming others, losing or damaging communication, and a myriad of things that keep us from addressing the task. This wise group was quick to assess the situation and speedily move toward resolution with getting caught up in the usual things that damage, prolong, or circumvent a solution. The key was keeping the goal in sight and always making sure that the group was moving toward to goal. When interrupting things happened they handled them efficiently and kept moving forward. 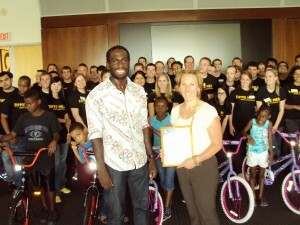 Thanks MBA students at the University of Iowa for a great Build-A-Bike Team Building Experience.